If you have ever wanted to take a picture, image, or photo and blow it up and print it on a large format paper, or multiple sheets of paper and tape it together, you might have a hard time finding the right tools. Sunset Reports can be easily used to print posters, or simpye your picture or photo on multiple sheets of paper. Choose as many sheets wide and tall you want, and print them out. This concept works well too for signs. For a sign, you can use the label or rich text control. 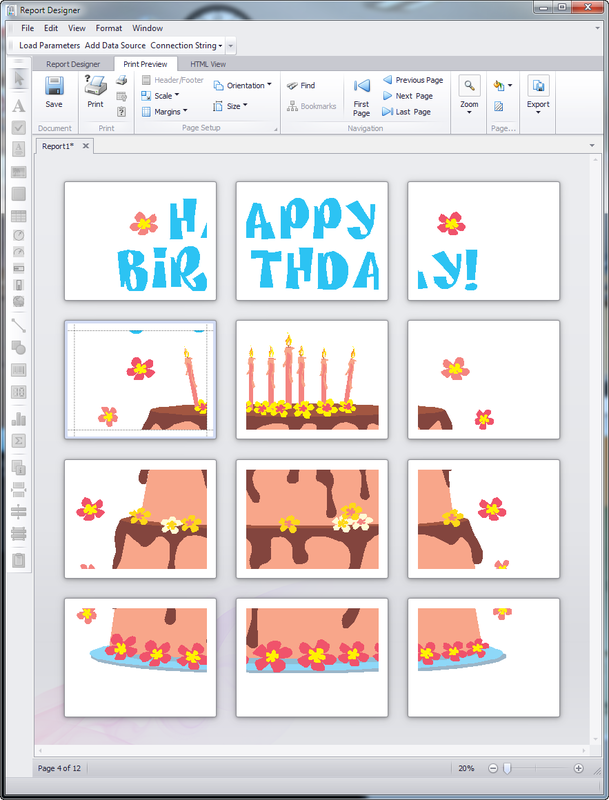 And you can also use any other combination of controls for both text and images. 3 – Add a picture box control. 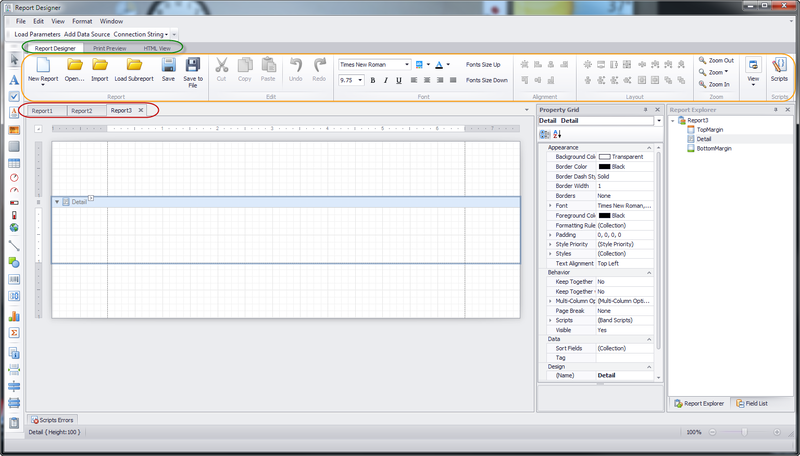 5 – Size your picture by changing the size properties of the Picture Box control. The size is set usually by hundreds of an inch(or tenths of a millimeter). For example 2000 = 20 inches. 8 – Go to Print Preview to see your result. 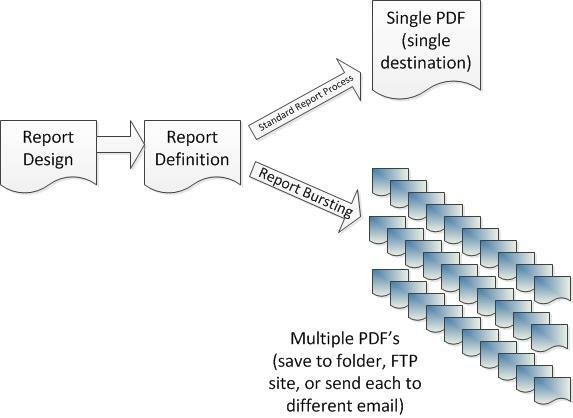 Then either print it, or go back to Report Design to tweak your document. Here is a print preview of an image that was stretched to 3 pages wide by 4 pages high. 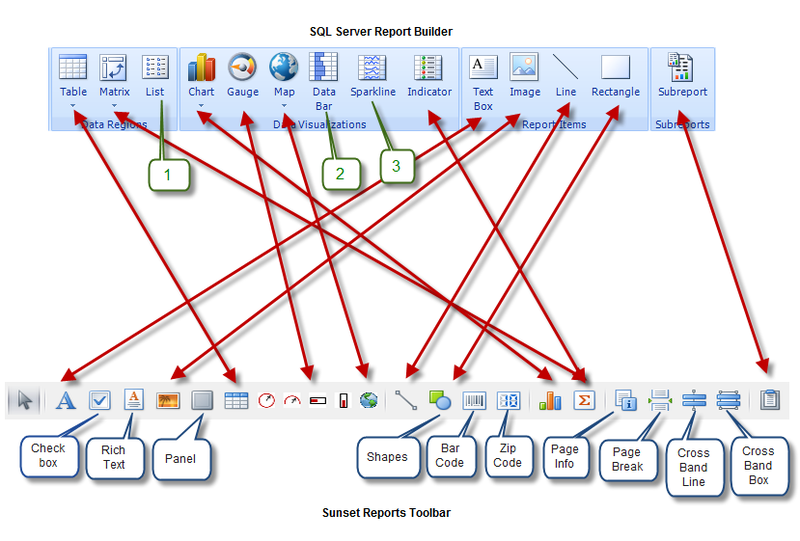 In the following figure we have compared the report designer toolbars between Access 2010 and Sunset Reports. The items on the bottom of the figure with a blue callout show items that Sunset Reports has and Access does not have. Although one might argue that the “Unbound Object Frame” (2) or the “Bound Object Frame” (4) can provide this missing functionality. If you can accomplish something similar, it is far more difficult and more restrictive than the native Sunset Reports controls. 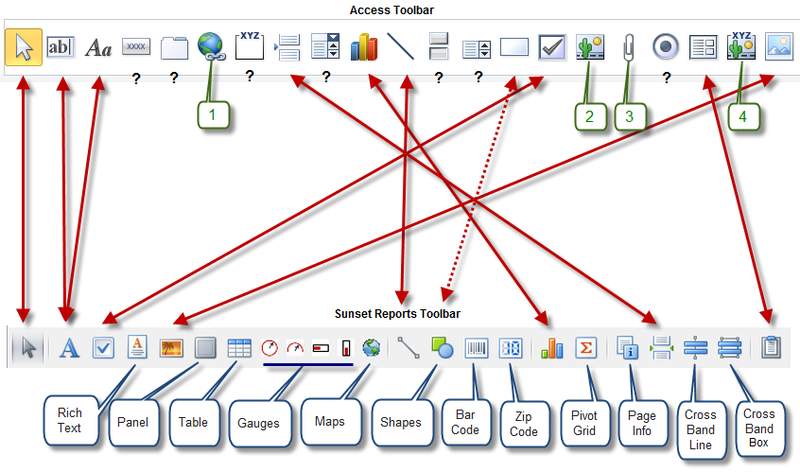 The “Hyperlink” control on the Access Toolbar is actually available on all the controls in Sunset Reports. And finally, Access has a control called “Attachment” (3). This is an attempt to provide a link to an external file or an database object. 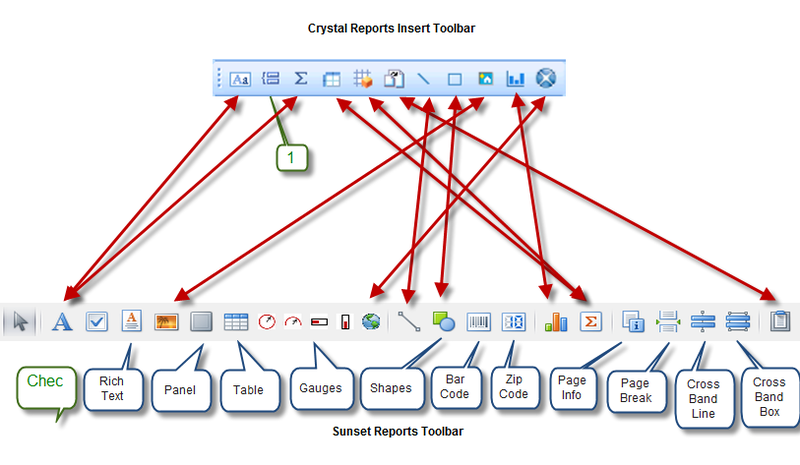 If the object is an image, use the Sunset Reports picture box. 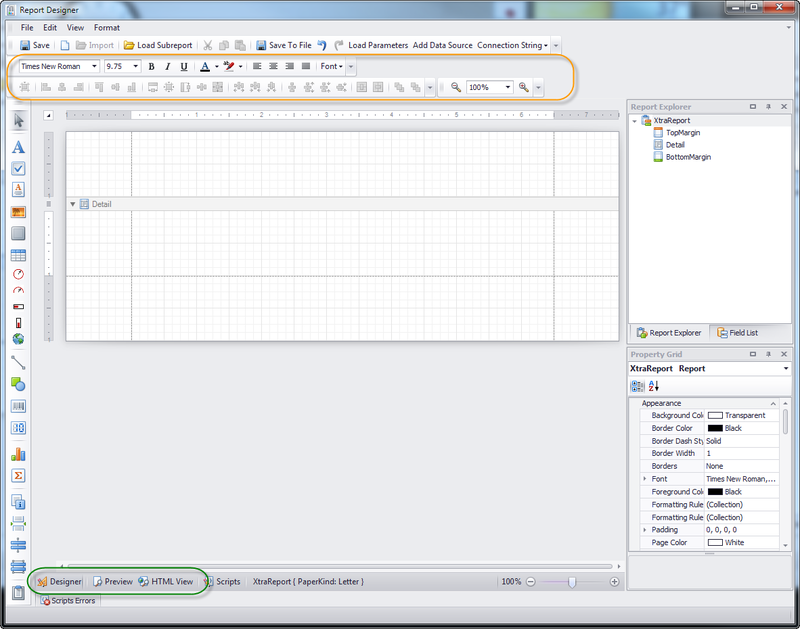 If the object is text, use the Sunset Reports Rich Text control.